The substance of this book is based on the ideas published by Dr. Israr Ahmad in 1993 in the olumns of the Urdu daily Nawa-e-Waqt of Lahore. The series of write-ups continued for a few months and were widely read with interest. The entire material, after slight editing, was published in a book form in October 1993 under the title Sabiqa aur Maujuda Musalman Ummatun ka Mazi, Haal, aur Mustaqbil, and has since gone through many re-prints. Dr. Ahmed Afzaal rendered these ideas into English and part of it was serialized in 1995-96 in the monthly Hikmat-e-Qur’an published by the Markazi Anjuman Khuddam-ul-Qur’an Lahore. For putting it into a compact book, he further revised the entire material, added his own sub-titles, and made it more authentic by giving quotations from the Old and New Testaments. Indeed he took great pains to make the citations of quite a few historical events and landmarks, particularly of early Jewish history, more authentic by giving dates and references from reliable sources. 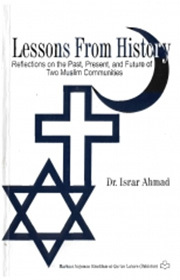 Moreover, he suggested a much more telling title for the book — Lessons from History — and the sub-title — Reflections on the Past, Present, and Future of Two Muslim Communities — puts in a capsule form the whole spectrum of ideas covered in the book. Dr. Israr Ahmad, as a true believer, is absolutely convinced of the indivisibility and essential identity of the Messages of all prophets. All Scriptures stem from and are parts of a single Source, the Mother of Books and the Hidden Book. According to the Qur’an, Prophethood is indeed an indivisible office: one cannot believe in some and not in others without giving the lie to the very source of Revelation. From the very beginning of the prophetic career, Prophet Muhammad (SAW) was himself absolutely convinced of the Divine character of the earlier revealed documents and the Divine Messengership of the bearers of those documents. This is why he recognized without a moment of hesitation that Abraham, Moses, Jesus, and other Old and New Testament religious personalities had been genuine prophets like himself. Thus the true followers of Moses were, according to the Qur’an, also Muslims as were the true followers of Prophet Jesus, until they deviated from the Right Path and adopted certain beliefs central to thercreeds. The most important of these are the Jewish claim to election and equally exclusivist claims to truth adopted by Christians. Nevertheless, Christians’ belief in incarnation and Trinity is castigated in the severest terms throughout the Qur’an.